The Hair and Scalp Extract AKA Stimulating Extract is available in Original formula (water/alcohol based) or Gel formula. 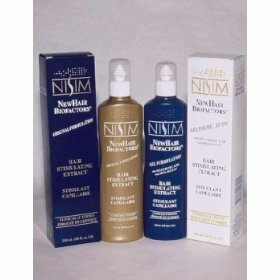 'Nisim Hair and Scalp Extract AKA Stimulating Extracts are MASSAGED into the scalp twice a day. The Extract is a leave-in treatment. Nisim is the ONLY non prescription product that can and does provide PROOF of its ability to neutralize DHT. Nisim does not rely on chemical irritants that cause skin irritation for vasodilation. Natural vasodilation occurs when the treatment is massaged into the scalp. The Extracts must be used in conjunction with Nisim Shampoos, the extracts are not a stand alone product. When you have achieved the desired results (typically 18-24 months) you can discontinue the use of the Stimulating Extract and maintain your hair using only the Nisim Shampoo. This is not a product you have to use for the rest of your life.